The TSEconomist celebrates its 20th issue! Inside this new issue, you will find a big interview with the recipient of the 2018 Jean-Jacques Laffont prize, Professor Daron Acemoglu from the MIT, on Artificial intelligence, institutions, and the future of work. 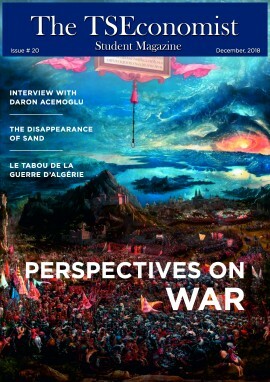 A spotlight with articles on perspectives on war, a french corner with more articles such "La Montagne d'Or" and as usual, professional content on feedback from internships, memoirs, and campus life.